It’s still snowing. We’ve been stuck at home for most of the week. We put chains on the tires in order to make it to my daughter’s house yesterday, but we had 6 more inches of accumulation while we were there and the trip home was a bit dicey. 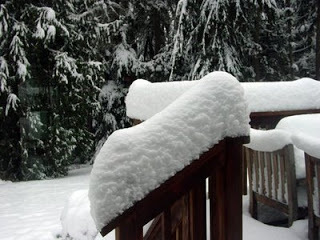 Today we got another 5 or so inches more than what you see in the picture above. The Seattle area seldom gets more than 2 feet of snow and they are not equipped to deal with it. Warmer weather and rain is predicted for tomorrow, but before we leave the season and get back to real life, here’s the wrap up for my Christmas stories. 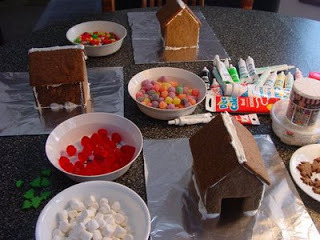 My husband started making gingerbread houses with the kids several years ago and it has now become a tradition. He bakes the cookies and sticks them together so they don’t have to wait for the “glue” to dry. The before picture is above. My turkey choices were limited to what was available at the only store I could get to. I rubbed Kosher salt under the skin and put the turkey in the refrigerator overnight to simulate brining. The next morning, I rinsed off the salt and stuffed the cavities with apples, carrots, celery, and herbs, and packed butter under the skin. Then the power went off for three hours. We fired up our new generator to keep the refrigerator going and built a fire in the wood stove. One oven was on the right circuit to be usable, but it was too small for the roasting pan. When the electricity came back on, I preheated the larger oven to 425 degrees. I forgot that I intended to turn it down to 325 as soon as I put the turkey in, but that turned out to be a good thing, because the power went out again an hour later. There was enough residual heat to carry over until it came back on, just as I was researching how to cook a turkey on a propane barbecue. The lights continued to wink and flicker and threaten, but everything kept working and the turkey turned out fine. However, I’ll have to try again to perfect my turkey recipe; I don’t think this one would be repeatable. 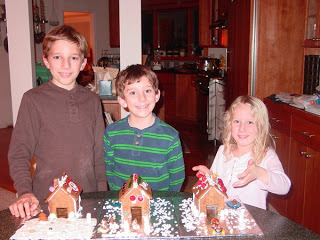 Gingerbread houses, Power outages, Turkey. Bookmark.